What makes a good leader? Is it someone who sets worthy objectives, develops effective strategies, and implements those plans efficiently and with a degree of excellence? 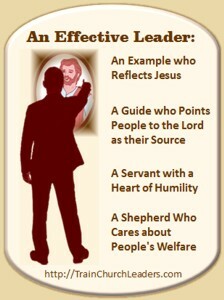 What a leader does matters but God zeros in on who the person is more than what one does. A good leader leads by example. To be an example, leaders must follow the example of Christ. The only legitimate expectation leaders can put on people for following them is when they are following the example of Christ. What Does it Mean for a Christ-follower to be an Example?